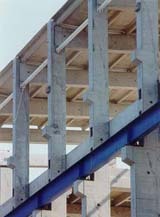 Precast prestressed concrete beams are available in both rectangular and ledger shapes to support various floor and roof systems. 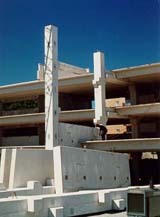 Precast prestressed concrete columns can be produced in square and rectangular profiles or can be shaped to suit the various design requirements as may be requested by the architects. The corbels can be formed in various locations to support floor beams and various other items as indicated in the photographs. 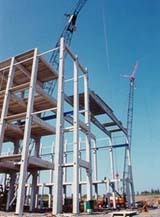 To obtain the best sizes and shapes, you should contact Strescon Limited for standard beams and columns.